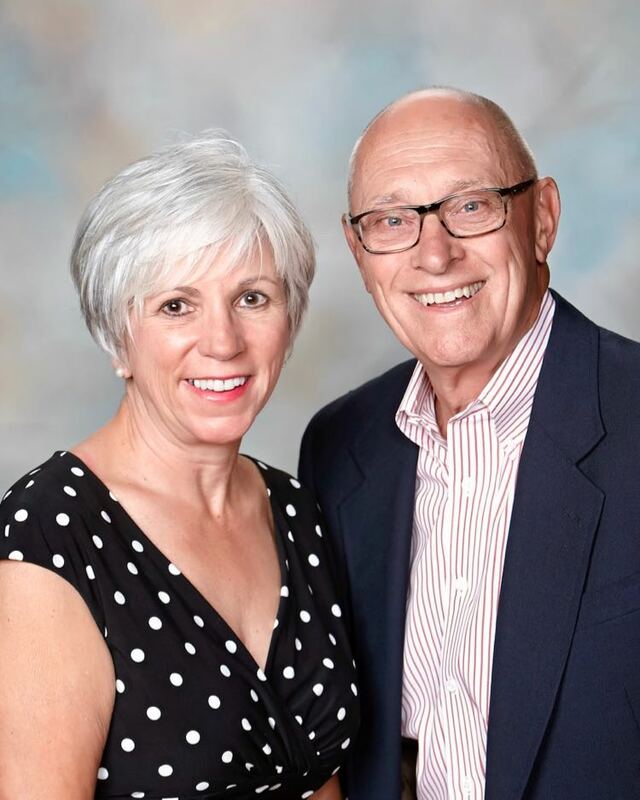 We are Pam and Gary Baker, from Sacramento, California, and we love to travel. About three or four years ago we decided to try our hand at travel writing. Why not? It looks easy, we’re well-traveled, and our friends were always asking for advice. We took a few online courses, learned how to write a query letter, and dreamed up some stories we would sell. Then we started pitching. We had a few stories published in local papers and on a couple of websites, but we weren’t getting much traction, certainly not with big name print magazines. In September 2015, a new lifestyle magazine started in our city and they accepted an article from Pam about wine tasting in a nearby wine region. Pretty soon she got regular assignments from the magazine. Then a funny thing happened. The editor quit, recommended Pam for the position, and the publisher hired her! That was a lucky break because it gave both us a chance to write for the magazine, get our stories published, and build up some bylines. That’s when the idea of writing together as a team was born. First, we wrote a story about exceptional wine tasting experiences in Sonoma, then another about Bogle Vineyard’s sustainability program. Things were rocking along but then the magazine closed down. We had to start over! Fortunately, Pam belonged to TravMedia (a great resource) and ran across a post by Roy Stevenson. We had heard of Roy before, signed up for his newsletter and had been reading it for months. If you subscribe to his weekly newsletter, then you already know it is jam-packed with valuable information. His website is also full of free, useful information. We found his eBooks a great source of info and very reasonably priced, too. When Roy advertised his coaching program, we signed up right away. Roy taught us how to come up with marketable story ideas, how to write an effective query letter, and how to build a solid distribution list of magazines to pitch. “It's a numbers game”, he told us. We did not know that before. 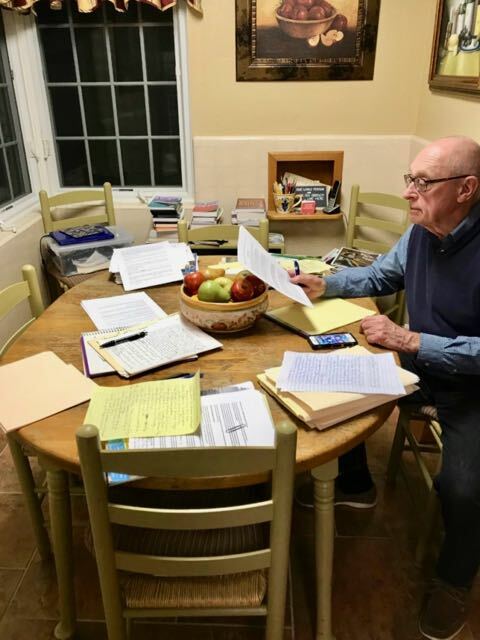 Here's Gary doing his research at the kitchen table. Then, a few months after starting our coaching program with Roy, we attended his Travel Writing & Marketing Master Class and Coaching Deep Dive in Seattle. We had just flown in from Europe the night before and worried we would be too jet lagged to stay awake during the workshop. But the excitement of the class and the tremendous information kept us awake all day long! We learned things in the class beyond what we could get from the books. And we made friends, too, with the same goals. We continued to stay in touch, encouraged each other, and cheered successes. We learned a network is important, which was further reinforced when we attended the Travel & Words Travel Writer’s Conference this year. Roy taught us how to be better writers. We’re still learning, still rookies with a long way to go. Our goal is to take more writing classes this year. Travel writing is not an easy field to break into, but we just kept following Roy’s process and began to have regular success. The more queries we had in “the hopper,” the more assignments we got. We've been working with Roy for one year and are now gaining momentum! Had a story published in a Bay area newspaper (both print and online) on the Sutter Creek gold rush era. Became regular contributors to a major cruise magazine. 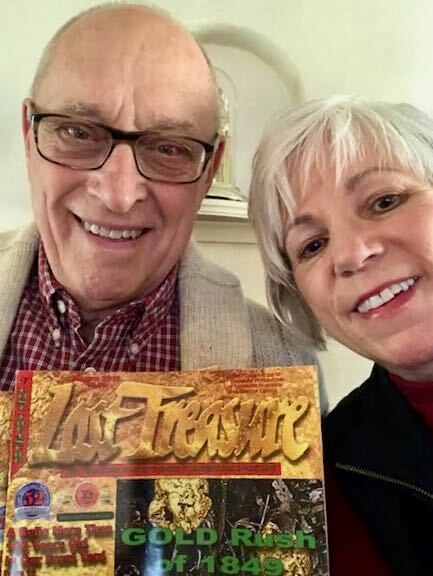 Had another article based on the Sutter Creek Gold Rush era published in the March 2018 issue of Lost Treasure Magazine. It was the cover story! 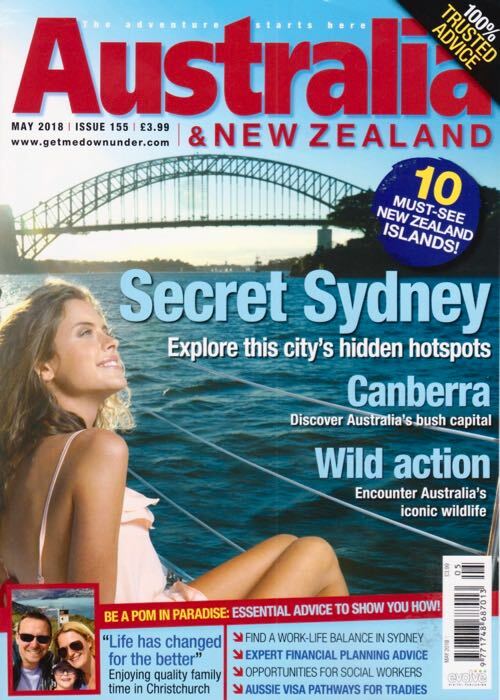 Had the cover story on “Secret Sydney” in the May 2018 issue of Australia and New Zealand Magazine. This is a “biggie”! Just finished an assignment for a Washington wine magazine on the Yakima Valley wineries and are getting repeat assignments from the editor. Just finished an assignment for an online wine magazine on the Tri-Cities wine region. Just finished a story on a classic auto museum (in our backyard) for Old Cars Weekly. Have a five-part series about Tri-Cities as a destination scheduled to be published in early 2019. All but one are paid assignments! Sharing our cover story on the Success Panel at the Seattle Travel Writing and Marketing Master Class in April, 2018. When we were in Washington this past April (2018) for Roy’s workshop (we participated on the “Success Panel”), we also attended the Travel and Words Conference in Yakima. We participated in our first FAM tour in Tri-Cities prior to the conference. Their Convention & Visitor’s Bureau put us up in the most amazing hotel overlooking the Columbia River, then wined and dined and toured us around the area for three days, all expenses paid. Hence, we gathered the material for two of the stories mentioned above. But, more importantly, on the FAM tour and later, at the Travel and Words Conference, we made some connections that led to other opportunities. One of the writers referred us to an exclusive Wine Writer’s Conference in Napa Valley. We just got back from this wine writer’s conference this week and it was an amazing experience. 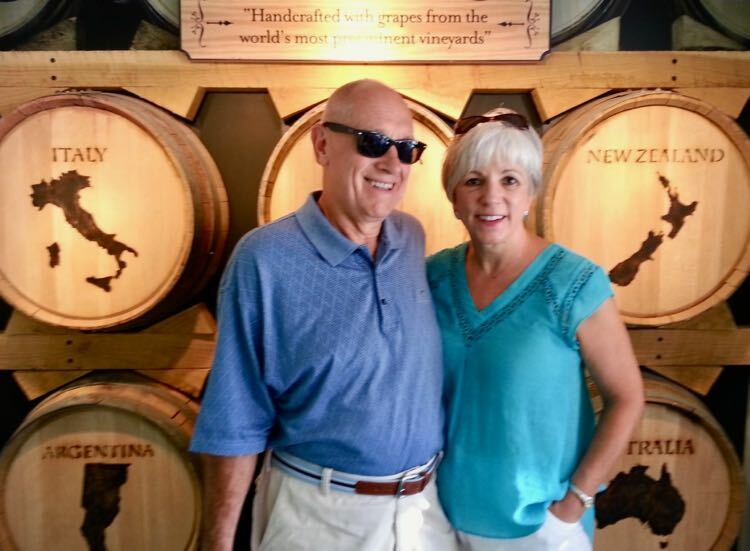 We tasted fine wines, enjoyed outdoor picnics at wineries, and extraordinary gourmet dinners at wineries, while learning about the history, terroir, soil structure, wine production and Napa Valley winemaker stories. At the Travel and Words Conference, we met with several CVBs and are scheduled to go on four-day wine cruise on a historic 126-foot schooner in Washington State’s Puget Sound, comped (of course) in exchange for three article assignments. Networking through social media has been very productive, too! We were recently invited to participate in our first travel podcast. 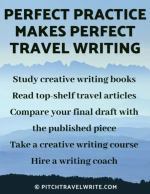 The best advice we can give people who are contemplating travel writing is to be patient and consistent. The lead time for print magazines can be lengthy. It took nearly a year from the time we pitched Lost Treasure until the article was published. Most importantly, don’t give up. If we could “reinvent ourselves” with a second career, you can too! We are having the time of our lives! 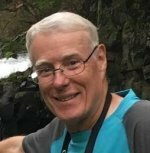 You can find out more about Pam and Gary Baker and find links to their articles on their travel writer’s website. In only 15 months as travel writers, Pam and Gary Baker have become an inspiring testament to how hard work can lead to spectacular success in a highly competitive field. 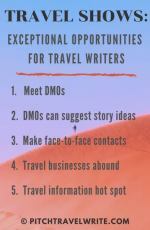 As their marketing coach and mentor, I’ve noticed that this industrious couple do several important things that have enabled them to launch their travel writing from the novice to advanced level. They follow every bit of my advice. They don’t get all cute and creative and break off and do their own thing. They stick diligently to the script — and have consequently reaped the rewards. They don’t get discouraged when they receive rejections from editors, or when they encounter some of the irritating problems that are part-and- parcel of the freelance travel writing game. The Baker's work hard at it! Here’s the best example that comes to mind from working with them: when I recommended they create a distribution list of every wine magazine in the English-speaking world, they did it. They sat down, researched the Internet, searched magazine racks and hunted down every possible wine magazine in existence. They didn’t quit when their list reached 15 magazines; they kept on tracking down more wine magazines until they believed they found them all. They realized that their success would depend on firing out plenty of query letters to plenty of magazines. As their coach, this couple has kept me busier editing their query letters and articles than the rest of my writers combined! They utilize my coaching services to the max and I couldn’t be more pleased with their success. My coaching and mentoring program is currently OPEN for 5 travel writers. If you're ready to find success with freelance travel writing like the Baker's have found, you can sign up now. Here's the link to learn more about this unique, one-on-one coaching program.